The Deena Speaks Dog Kit for Puppy Dogs contains everything that you will need to get your puppy off to a great start. Owning a puppy does not have to be an overwhelming experience. 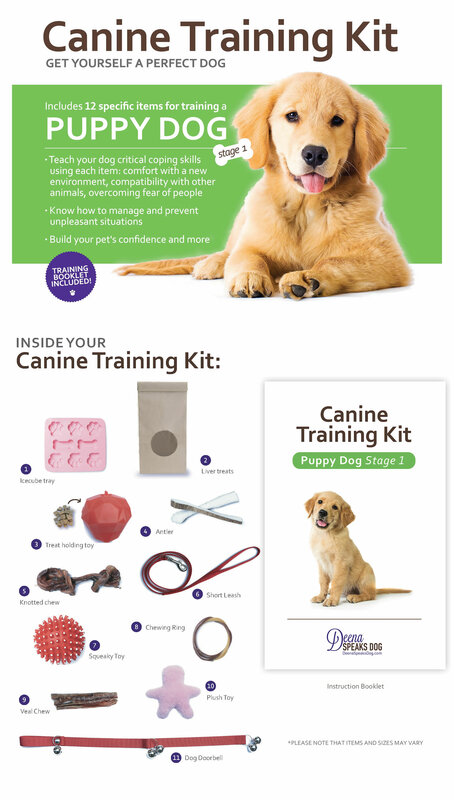 Using the kit will set both you and your puppy up for success by interacting in a positive way. The kit is meant to be used between the age of 7 to 16 weeks. This is the window of opportunity in which your puppy will be at his best for learning and enjoying the exercises. These exercises help to create a life balance of enjoyment and proper behaviour. They will channel the puppy’s mental and physical energies in a constructive and enjoyable way. Each item in the kit has been carefully selected and is designed to be used with an exercise to make training easy for both you and your dog. Your puppy will learn the basics as well as fun games such as hide and seek for a well-rounded beginning to his life with you and your family.